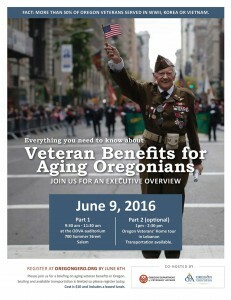 Please join the Oregon Gerontological Association and the Oregon Department of Veterans’ Affairs for a briefing on aging veteran benefits in Oregon from 9:30-11:30am. This will be followed by a tour (optional) of the Oregon Veterans’ Home in Lebanon. Transportation is available. Seating and available transportation is limited so please register today. Cost is $10 and includes a boxed lunch.